The Phuket Vegetarian Festival is not just about skewered cheeks, Chinese gods and firecrackers, although that's the fun part (and the first of the street processions is tomorrow morning). The food is also very important. Local people (not all, I might add) follow a strict diet which is vegan rather than just vegetarian - no meat, no eggs, no dairy, and for some reason (something to do with strong smells) no garlic or onions. The diet is to cleanse the body and spirit. It all started way back in 1825 when a Chinese traveling opera troupe (or circus depending what you read) came to the Kathu area of Phuket to perform. At that time, Kathu was the main town in Phuket as it was the center of the tin mining industry that helped make Phuket quite wealthy. Many Chinese settled here during the tin mining boom years, and thus you have a huge Thai-Chinese population in Phuket, mostly around Kathu and Phuket Town. Anyway, the travelers got sick, and then followed a vegetarian diet and bingo! They all got better! The festival has a long history and yes, I do like to go on about it, as this is something that makes Phuket special for me. See - Phuket is way more than beaches and tourists. 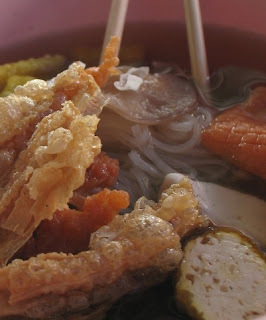 Phuket has a rich history, and at this time of year you can really get a taste of something special. Do pardon the pun. Later this week I'll be heading out to see some of the processions, and also some of the other rituals at the shrines such as firewalking and bladed ladder climbing. I want to get some video this year, though my camera is but a simple one... Last couple of years I stuck to still photos - see Vegetarian Festival Photos. So, for now, I am still at work all day, but will start a holiday on Friday, so there will be time to get around the shrines. I started on "the diet" yesterday. The food is pretty darn good actually, and fortunately there's a good place to eat close to work. 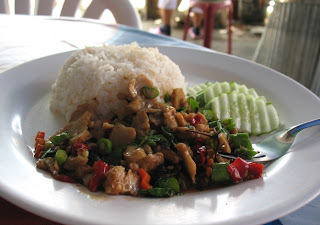 If you are on the back road in Karon, just opposite the post office on the corner of the little road that goes up to CC Blooms Hotel, you find a great little restaurant that is very popular at festival time (actually its pretty good year round for cheap Thai food). 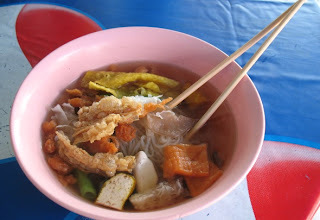 Lunch today started with a vegetarian noodle soup, packed full of all kinds of things, none of them meaty, all delicious ... it's called Yentafo. The meat version I probably would not eat as it tends to include things like coagulated blood and bits of squid. Call me picky.. Little know secret, but I was vegetarian for quite a few years many years ago, so even today I am a bit picky with meat dishes! And now a close up... And I think the same tomorrow lunchtime! Of course I am a hypocrite waxing lyrical about this food. By next week I'll be having eggs, bacon and chips for lunch again! But for now, for a week or so, this food is great! 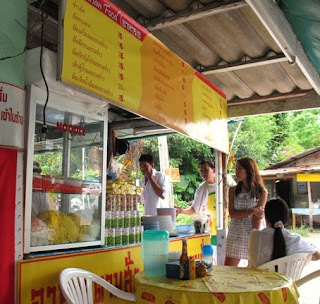 If you are in Phuket during the festival look for the stalls or restaurants with the yellow signs. Try something different! 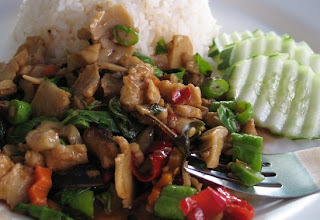 There's a newer, better page on this blog on the same subject - see Phuket Vegetarian Festival Food.